I'm not sure you understood what I was talking about in my post. I have nothing to argue about. If you have personal opinions on what theories have shown, or what they haven't, etc., you are certainly entitled to them. I merely wanted to point out that there is no system more primitive that logic or mathematics nothing logically possible exits outside them. It's either incomplete or inconsistent, has to be one or the other, that's what Godel proved some decades ago. No I don't think you fully understand Gödels theorem. Do some research only systems containing Arithmetic-not only arithmetic but also addition and multiplication as well as '0' and 'successor of'- are incomplete. Thus a system containing addition but no multiplication is complete and vice versa. Addition is not complete. Do you really think all fields of science and engineering can be reduced to simple addition? See above. You have a misconception pertaining to completeness. It simply means no statements will be produced that are false. Such as 1 + 1=3 or the like it in no way implies that all of science is reducible to addition. So unless Godel has been refuted and you're the only one that knows about it, I have to say you don't know what you're talking about. Again go and read the wikipedia entry on TOE then scroll down to the incompleteness section for a quick discussion on why it is full and well possible for a TOE to exist that is consistent and complete. All I have to say, is that if you think you have a formal, complete, and consistent system, produce it. You'll be the first, and believe me, much greater minds than yours or mine have been trying for decades. Somewhere you are misunderstanding the whole theorem. As I have said go read about it go to wikipedia even their entry on the incompleteness theory will give you examples of systems that are complete. Only systems containing the necessary arithmetic (addition multiplication '0' and 'successor of' are incomplete). And as I have said i already have a example elementary geometry since it does not contain the required arithmetic to be incomplete. If you have read all those links we can debate further. Good thread. I don't frequent this board so I could have easily missed it. I'm inclined to believe that an absolute TOE to be impossible, that is, a theory that can describe EVERY action/outcome with exact precision. I believe there is evidence to suggest there is inherent irreducible randomness involved in some physical phenomenon (polarization, decay, uncertainty principle etc). In the macroscopic world however, I think theories will come very close to describing reality. That said, my knowledge of such things isn't strong. I've read GEB and study about am doing a PhD in statistics. I studied maths/physics in undergrad. I trust you have read "Godel, Esher, Bach" by Douglas Hofstadter? Gödel, Escher, Bach: an Eternal Golden Braid (commonly GEB) is a Pulitzer Prize-winning book by Douglas Hofstadter, described by the author as "a metaphorical fugue on minds and machines in the spirit of Lewis Carroll". On its surface, GEB examines logician Kurt Gödel, artist M. C. Escher and composer Johann Sebastian Bach, discussing common themes in their work and lives. At a deeper level, the book is a detailed and subtle exposition of concepts fundamental to mathematics, symmetry, and intelligence. Through illustration and analysis, the book discusses how self-reference and formal rules allow systems to acquire meaning despite being made of "meaningless" elements. It also discusses what it means to communicate, how knowledge can be represented and stored, the methods and limitations of symbolic representation, and even the fundamental notion of "meaning" itself. In response to confusion over the book's theme, Hofstadter has emphasized that GEB is not about mathematics, art, and music but rather about how cognition and thinking emerge from well-hidden neurological mechanisms. In the book, he presents an analogy about how the individual neurons of the brain coordinate to create a unified sense of a coherent mind by comparing it to the social organization displayed in a colony of ants. If not I highly recommend it... I just went back and reread it recently after decades... its not an easy read... and even though I've read it before it still took me three months.... but if you are interested in cognition it is definitely a must. Like Julian Jaynes "The Origin of Consciousness in the Breakdown of the Bicameral Mind' there are flaws in his arguments but I am not smart enough to pin them down... I just know that they are there. Still GEB is a profitable read as is Jaynes. Also known as the Cantor set, possibly the first pure fractal ever found – by Georg Cantor around 1872. To produce Cantor Dust, start with a line segment, divide it in to three equal smaller segments, take out the middle one, and repeat this process indefinitely. 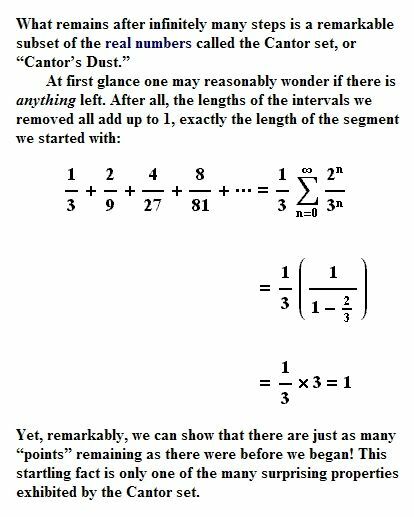 Although Cantor Dust is riddled with infinitely many gaps, it still contains uncountably many points. It has a fractal dimension of log 2/log 3, or approximately 0.631. Cantor basically proved a result along the same lines as Gödel, essentially that we may be able to use mathematics to describe a phenomenon, but sometimes that description won't make any sense. Many others considered him a profound genius. I really don't think that Cantor result is that self-contradictory. Space and time are quantized. Thinking you can build a TOE off the current physical model is incorrect. The universe is not mechanical. Look towards digital physics, not Newtons idea of a clockwork universe. It just doesn't work with quantum mechanical systems. Math can describe the rules of our universe. But it does not explain everything. Western Sciences idea of a TOE would be to describe the 3 dimensions of a box using math. What that box is, where that box came from, what lies outside the box fundementally can not be described by math. Therefore a TOE that strictly uses math will be a flawed TOE. Math is what WE say about the universe, not how it fundementally is. To think otherwise is an anthrophomorphic flaw. by the definition of the incompleteness of the TOE that there will always be statements (when physically translated : experiments or observations) that are unprovable with the current TOE thus meaning no coherent form of determinism will ever be possible in such a universe. I don't understand how it follows that, just because a finite, causal universe cannot be fully and consistently described, it cannot also be causally determined. I agree that it means that we can't predict its causally determined outcomes accurately, but how does that deliver choice about future states to components and systems within the universe? Wonderful, mind-stretching topic, by the way. Ian MacLean, come back!